Colombian journalist Ernesto Londoño, who campaign publishers (sic) of The New York Times about Cuba is attributed, is in Havana for work, as revealed on his Twitter account. “Eager to travel to Cuba, which last visited as a college student, more than a decade,” Londoño said in the social network before departure and showed a picture of his ticket Miami-Havana flight American Airlines. “Happy to be in Havana on a working trip”, released four hours later. “Which topics are you curious about?” he asked to his followers. 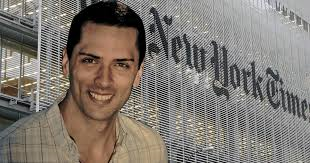 Ernesto Londono, 33, came to the Editorial Board of The New York Times last September. Previously he worked at The Washington Post. Starting October 11, the New York daily began publishing a weekly article dedicated to defending a change in US policy toward Cuba. So far are six. “And we intend to publish more,” said Londoño. Editorials in the last six weeks have called for ending the embargo and an exchange of the three Cuban spies imprisoned in the United States by the US contractor Alan Gross, imprisoned in Cuba. They have also criticized Washington programs to promote democracy in Cuba and the US program that helps Cuban doctors to escape from missions abroad organized by Cuban government. Is Obama Contemplating Unilateral Action on Cuba? Know Mr. Londono what the Cuban spy network have been doing in USA and around the World since 1959? I wonder that Mr. Londono read the General Mitroking files about the KGB/DGI activities inside the USA. Mr. Londono you ignore or you want to be ignorant about the True about Castro’s system to destroy Cuba at all kind of level. Mr. Londono you’re a repugnant person. Cubans do not celebrate Thanksgiving in Habana, Cuba or anywhere else on the island of Cuba for that matter, not now nor at any time in Cuban history prior to 1959 nor afterward. Such a holiday is an Anglo Saxon tradition officialized as a national holiday by John Hanson the first President of the United States of America. Therefore the headline; “Pro-Castro New York Times Journalist Enjoying Thanksgiving in Havana” is inaccurate for what its worth. Which leads me to think, if the headline is spun out of reality, what will be body copy be like? Or even perhaps, what agenda does this headline fit into? And, who´s agenda is it, anyway, and why? I wonder how many Americans traveled to China during the commemoration of the Thanksgiving holiday in the United States prior to the year 1971? It is perfectly logical if Mr. Lodoño has journalistic assigments pending in Cuba regarding the trade embargo issue to be written about, it is also perfectly plausible that a trip to Cuba should be in order, the subject matter of such assignment. So what is the fuzz about all of this? In this nation, anyone is free to travel–at free will–and that makes Mr. Lodoño´s trip to Cuba perfectly viable as his personal choice. I think its pretty disgusting the type of latent racial problems we´re having in this great nation–at this very time–during the bottom half of the twenty first century, someone is preoccupied with a trip to Cuba by Mr. Lodoño as part of his assingment in a series of newspaper articles planned to be written. Actually it´s not disgusting the Word “repugnant” has more meaning in this tense tan in the accusation of a person fro execercising his free will to travel ton Cuba whenever he desires as part of his journalistic labor. Mr Garrido, you missed the point of the headline. A journalist working for an American newspaper left for Cuba on an American holiday weekend. Happy Thanksgiving! No Mr. Simmons, it is you who has totally missed the point and simultaneously mischaracterized an issue with your gross journalistic factual storyline´s headline mistake and your literally error in your recent headline, which stated: “Pro-Castro New York Times Journalist Enjoying Thanksgiving in Havana”. Now, Mr. Simmons–once again–Mr. Lodoño is not “Enjoying Thanskgiving in Havana”. Mr. Lodoño is–more than likely– enjoying his visit of choice to Havana, the capital city of Cuba, where Mr. Lodoño will not enjoy Thanksgiving. First, because if Mr. Lodoño cared to celebrate Thanksgiving–a U.S. holiday–he would have stayed here in the U.S. However, in your effort to put some credibility thread to your presumption that the New York Times and Cuba are working together, behind the scenes, you made the journalistic mistake of tossing “Thanksgiving” into the headline of your article. Why don´t you ask Mr. Lodoño if he traveled to “Enjoy Thanksgiving in Cuba”, as you recently stated in your article. You know, Mr. Simmons, what Mr. Lodoño´s answer will be. A flat no. So please, Mr. Simmons, don´t insult my intelligence by telling me while flashing the cliché: “you missed the point of the headline”. First, Mr. Simmons, headlines don´t have points to make, they have news to report or stories to opine about and second, headlines have to be supported to withstand the test of journalistic and literary accuracy. You, Mr. Simmons, failed on both counts. Your headline is inaccurate because Mr. Lodoño did not go to Cuba to “Enjoy Thanksgiving” as you state and it cannot be supported because “Thanskgiving” is not celebreted in Cuba, only in the U.S. of all countries in the world. Having said that, my point to you, Mr. Simmons, is that you are so preoccupied with attempting to imply your presumptious allegation of the collaborative activities between the New York Times and Cuba that you disregarded the facts and ergo the truth. And that´s usually what happens to unsupported stories written with an accussatory tone and agenda, as in the case in point, as if there was a conspiracy between the New York Times and Cuba on a hidden agenda to end the trade embargo. The whole thing is so trite is sickning. And believe me, you´re not Cuban American, I am. I´ve been hearing stories as this for the past 56 years. It´s time to move-on about the way the world has changed. Nothing would be so well received by the majority of Cuban Americans today than the news about the U.S. and Cuba moving forward to normailize diplomatic relations as China and the U.S. did a long time ago. Oh!, and don´t you worry about Cubans in the island, Cuba will become a leading nation, not only in Latin America but throughout the league of world nations. The U.S. and Great Britain, too, were once at odds–in opposing positions–during the American Revolution. China and the U.S. normalized relations too. So many lives lost in Viet Nam to accomplish what? look at Viet Nam today and the U.S. The rest is history. So please spare me when you say I missed the whole point of your own erroneous headline in what is rather a trite story, in my opinion. There´s a terrific Cuban saying: “All birds eat rice, but they always blame it on the black crow” (emphasis on “black”) (“Todos los pájaros comen arroz, pero siempre le echan la culpa al Toti”. That Cuban saying could not ring more true–today in the bottom of the twenty-first century–about the racial domestic situation in the U.S. today. It´s a truly hard pill to swallow, but in all candor it is the truth. So don´t worry so much about Cuba, an island of 12 million people in comparison to over 300 million citizens in the U.S. and where the value of the U.S. dollar will once again be lower than the value of the Cuban currency of choice, when the embargo is ended and the Cuban people can work under fair trading practices as most countries in the world. If you don´t believe this, just take a good look at Miami and take a look–right now–at the transformation of change in Cuba before your eyes. China started too with baby steps. Is that what you´re advocating for the United States? I trust you enjoyed your “Thanksgiving” holiday. As for me, I had red snapper on a bed potatoes dressed in extra virgin Spanish olive oil and gave thanks too!